Since XWiki Rendering uses XWiki Components, you'll also need the Component Manager API JAR (xwiki-commons-component-api and a Component Manager implementation. You could develop one that bridges to your own component system (Guice, Spring, etc) or you can use the xwiki-commons-component-default one that we provide. the JARs for the macros you want to use (macros correspond to directories named xwiki-rendering-macro-*). The jcl-over-slf4j JAR which tells all JCL calls to be sent to SLF4J. Since XWiki Rendering uses some third party libraries using JCL you'll need this. The logback-classic JAR which sends SLF4J calls to Logback. 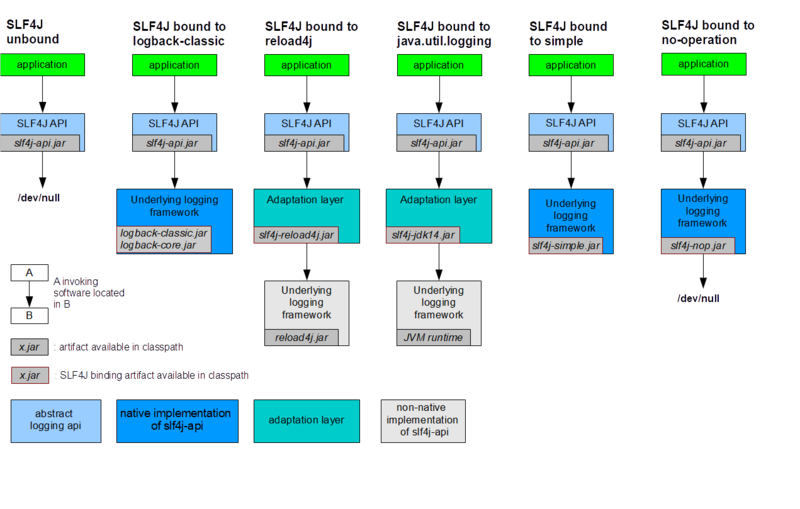 Of course you can choose to use any of the other SLF4J bindings available (see diagram). You can also decide to not provide a binding in which cases logs will just be ignored. Note that not only you need the JARs mentioned above but you also need all the transitive dependencies required by those JARs... If you're using Maven then you'll get those dependencies out of the box and if you use the Standalone ZIP you'll get them in the ZIP. The XWiki Rendering JARs are available in the Maven Central Repository since XWiki Rendering 3.2 Milestone 3. Note that you can get the full transitive dependency list by typing mvn dependency:list or mvn dependency:tree and you can get an uberjar with mvn assembly:single -DdescriptorId=jar-with-dependencies. Prior to XWiki 4.4M1 we used to distribute a Standalone JAR which was shading dependencies. We've removed it in 4.4M1 since it could lead to issues as shading isn't a perfect process (some dependencies couldn't be shaded for example). We thus believe it's better that you take care of integrating the various dependencies required by XWiki Rendering when you use it in your own project. If you're not using Maven then we've made available a Standalone ZIP (snapshot versions available too) which contains all the JARs in one ZIP. You'll need to take those JARs and make them available in your runtime CLASSPATH. Then you can use any of the examples defined below. These examples should work with XWiki Rendering 4.1 and beyond (you can download them here). Take content written in XWiki Syntax 2.1 and generate XHTML as output. // Use the Converter component to convert between one syntax to another. // Convert input in XWiki Syntax 2.1 into XHTML. The result is stored in the printer. Parse content written in XWiki Syntax 2.1, look for all links and wrap them with italics and render the whole thing in XWiki Syntax 2.1. // Parse XWiki 2.1 Syntax using a Parser. Parse a content written in XWiki Syntax 2.1 and containing the Id Macro and generate XHTML. // Execute the Macro Transformation to execute Macros. XWiki Rendering supports 2 cases: if you're inside a wiki or not. If you're not inside a wiki for example the Link and Image Renderers will only handle links and images pointing to URLs and not handle them if they point to a document. To decide if it's inside a wiki or not, the code checks to see if it can find a component implementing the WikiModel interface. This interfaces exposes methods corresponding to features that any wiki should have. This allows you to integrate XWiki Rendering with your own wiki.